Goldsmith Willeke forged the rings for the top players of the German Handball League since 2007. 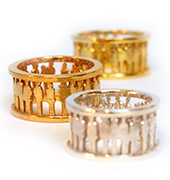 Celebrities such as Stefan Kretschmar, Volker Zerbe or Markus Bauer waer a ring made in Dortmund. "Menschen" – a cooperation with the German painter Annette Göke. "Help to healing" is based on a powerful gem, the tourmaline. 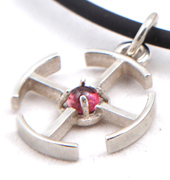 A symbol with enormous dynamic power has been worked into a pendant. With the production we support the campaign Rüdiger Nehberg TARGET e.V. It was an honor to design the belt buckle for the lead singer of the band "Tokio Hotel". He wore this piece of jewellery/masterpiece during his stage appearance in the worldwide popular show "Wetten, dass ...". The lettering "humanoid" that adorns the buckle and is the title of the album of the band, which was presented in the show.